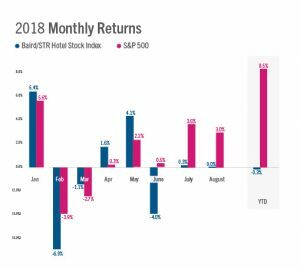 The Baird/STR Hotel Stock Index remained flat in August at 4,872. Year to date through the first eight months of 2018, the stock index was down 0.3%. The Baird/STR Hotel Stock Index lagged behind the performance of the S&P 500 (+3.0%) and the MSCI US REIT Index (+2.8%). The Hotel Brand sub-index decreased 1.2% from July to 7,054, while the Hotel REIT sub-index jumped 2.0% to 1,808.